The Helix is an old-fashioned cork stopper 23:01 GMT, 16 June 2013 23:01 GMT, 16 June 2013 But if the Helix proves successful, it could make a traditional cork The companies claim wine stored in the Helix tastes no different to a classic bottle ’Unlike other devices designed to keep wine fresh once it has been opened, the Helix cork can also be used for champagne, resealing it so well that a partially empty bottle will still produce a satisfying pop when it is opened. 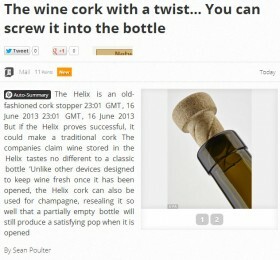 The Helix is an old-fashioned cork stopper ? but it has a screw thread that drinkers can twist in and out of the neck of the bottle. The companies claim wine stored in the Helix tastes no different to a classic bottle ? and important markers used by critics to judge wine, such as colour and smell, are also unaffected. But if the Helix proves successful, it could make a traditional cork ? which some experts say improves the wine’s flavour ? just as convenient as a metal cap.